Swans breed in freshwater marshes, ponds, lakes and along slow-flowing rivers. Most Swans find their mates before the age of 2 years - usually during the winter season. Even though some may nest for the first time when they are two years old, most won't start until they are 3 to 7 years old. 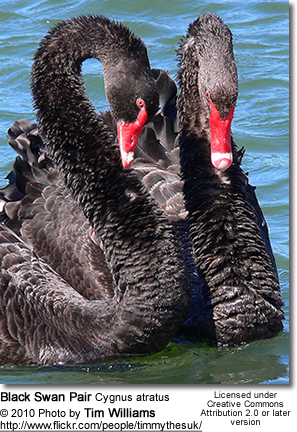 Swans are believed to form lifelong pair bonds. However, if one mate dies, the survivor will find another mate. Mute swans have been observed to display homosexual or transgender behavior. Upon arrival in the breeding territory, the pair will engage in courtship behavior, which includes bobbing their heads and facing each other with quivering wings. Nesting usually occurs from April through July. They will nest in areas with ample food supply, shallow and uncontaminated water, and few disturbances. Usually, only one pair nests on a single body of water. These nesting territories range from 6 to 150 acres in size and are often located near where the female was hatched. The female chooses the nesting area, while the male defends it. Swan pairs are most likely to return to the same nesting site if they were able to raise young successfully there in the past. The Swan's nesting season is timed to take advantage of readily available food supplies. Nest sites are typically situated on slightly elevated sites surrounded by water. This could be a small island, or on top of old beaver houses, dams or muskrat mounds, or on emergent vegetation that is either floating or anchored to the bottom of the water. Breeding pairs will either repair and reuse nests used during previous seasons, or they will build a new nest. Nest construction often begins in mid-April and may take up to two weeks. The male uproots aquatic vegetation, grasses and sedges, and transfers it to the female, who will first pile it up high and then uses her body to form a depression to place her eggs in. It's basically shaped like a large open bowl. The interior is lined with down and feathers. Once completed, the nests may reach a diameter of up to 11.5 feet (1 to 3.5 meter). The nest is often surrounded by a 20 to 30 foot (6 to 9 meter)ditch - usually filled with water to make it more difficult for mammalian predators to access the nest. Beginning in late April to June, the female usually starts laying eggs - often before the nest is even completed. Eggs are laid every other day until the clutch is complete. The average clutch consists of 2 to 10 creamy white eggs, but in most cases 5. If it is the female's first clutch, she is likely to lay fewer eggs and these eggs are more likely to be infertile. An Trumpeter Swan's egg is about 2.9 in (73 mm) wide and 4.5 in (113.5 mm) long; and weighs about 11.3 oz or 320 g. A Mute Swan's egg is about 113 x 74 mm and weighs 340 g.
Once a clutch is complete, the female incubates the eggs for about 32 to 45 days, while the male remains nearby to defend the nest against intruders and predators. Very rarely, the male may help brooding the eggs. During the incubation period, the female leaves the nest only for short periods to feed on nearby vegetation, bathe and preen her feathers - however, before doing so, she usually covers the eggs with nesting material to conceal them. The male will also remain nearby to deter predators. The parents usually perform a "victory display" after intruders are deterred - which is similar to their courtship display and consists of facing each another while quivering their wings and trumpeting loudly. They may lay a second clutch if the first eggs or cygnets are lost. 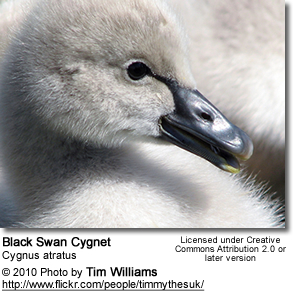 Swan chicks are commonly referred to as cygnets. Hatching usually occurs from June to July. The hatchlings are covered with down and their eyes are open. Within 24 hours of hatching, the cygnets are able to leave the nest and another day later, they are able swim and dive under water to escape danger. The cygnets weigh only about 7 - 10.5 ounces (~ 200 - 300 grams) when they hatch; but grow quickly gaining 20% of their body weight every day at the early stages. By the time they take their first flight they weigh about 15.5 pounds (7 kilograms). Both parents feed and protect the young. For the first weeks after hatching, the parents will intermittently brood the cygnets during poor weather and cold spells. 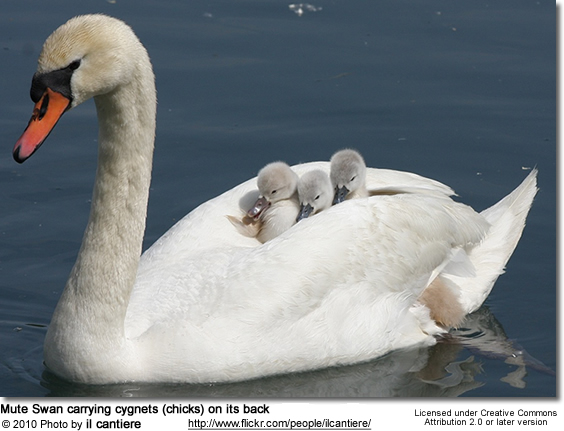 Typical Swans (genus Cygnus) are often seen carrying cygnets on their back. When the young are about two weeks old, they are able to feed themselves. As this point, their diet mostly consists of aquatic insects and crustaceans. Even though the adult swans only eat plant matter, cygnets initially focus on protein-rich insects to support their rapid growth. By the time they are 4 to 6 weeks old, the young swans start changing over to a plant-based diet; and by the time they are 2 to 3 months, their diet is similar to the adults' -- consisting of stems, tubers, leaves and roots of aquatic plants. When they are 4 weeks old, the shoulder (scapular), tail and flank feathers are replacing the feather down. At six weeks, the under plumage and cheeks are fully feathered. By seven weeks, they have most neck and headfeathers. They are usually fully feathered when they are about 9 - 10 weeks old. By the time they are 8 to 10 weeks old, they have reached half their adult size and have the juvenile grey plumage that they retain until their second winter. By the time they are 13 to 17 weeks old, the cygnets weigh about 20 pounds (9 kg) and they learn to fly. Fledglings usually remain close to their parents for continued protection and brooding until the next spring. In late September, the young swans take daily practice flights in preparation for the winter migration. These flights are initially short, but get longer as the young grow stronger. As the temperatures go down and just before the water begins to freeze, family groups or mated pairs commence their migration to the wintering territories. The young remain with their parents throughout the winter and migrate with them to their breeding territory in spring. When the cygnets are about one year old, the parents drive them away as they are getting ready for their next brood. The juveniles remain together in sibling groups until they are about two years old, at which time, they themselves commence their search for mates. Some may return to their parents after the breeding season, since their family bonds are generally strong. Although this bird can be tame, especially to those who feed it daily, it is aggressive in defense of its nest, and its size and impressive hissing make it a formidable adversary for animals as large as a fox. Large waterfowl, such as Canada Geese may be driven off, and there have been many reports of Mute Swans attacking people who enter their territory. 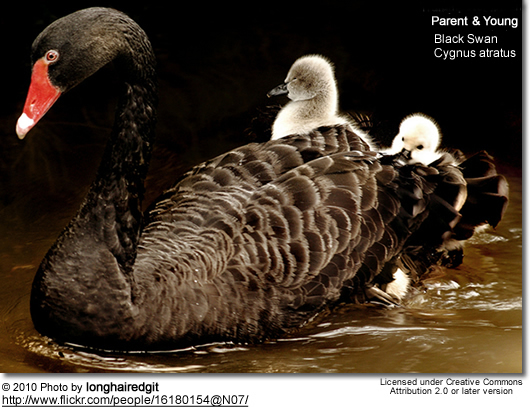 The cob is also responsible for defending the cygnets while on the water, and will sometimes attack small watercraft, such as canoes, that it feels are a threat to its young. The cob will also try and chase the predator out of his family territory, and will keep animals such as foxes and birds at bay. Trumpeter Swans will sometimes leave their nests if threatened. Mute Swans will attack land animals in defense of their families, during the period before fledging of their offspring (which, at six months, is longer than that of most other birds).